We’ve given thought to the advantages of full timing. Who wants to hear whining about our problems, anyway? Wait, what problems? We don’t have problems. Admittedly a little thin, this list. Richard mentioned, tough to get a hospital bed in or out of the travel trailer. Lani, Chris, and Emerson just needed more space and are happy to land in a house in Virginia. How about this folks, can you help us substantiate this? Are there more important issues than the ten we listed above? What disadvantages do you experience or anticipate regarding living full-time in a travel trailer? Anyone who has full-timed in an RV knows there are many advantages to living in a compact and mobile space. Many other people know little or nothing about qualities of rolling homes. Almost three years ago we came up with Top Ten Advantages of Living in a Travel Trailer. It remains our most popular post ever, even eclipsing the iHouse posts. We’ve also spent almost three more years full-timing since we first posted “Top Ten Advantages”. Nothing has changed our intense enjoyment of, and appreciation for, our full-timing lifestyle. Quite the opposite, we continue to find full-timing better and better as we explore different things to do on the road. Last year we spent time in New York, the Bahamas, Florida, Arizona, Iowa, and Kansas. We were able to stay one or more weeks in every one of those great places doing what we love, playing tennis, walking the beach, being with family and friends. This year we spent time in Lake Junaluska NC, Myrtle Beach SC, Charlotte and Kannapolis NC, Michigan’s Upper Peninsula, crossing from Kenora Ontario to Dawson City Yukon Territory, touring Alaska, and visiting grandchildren in Vancouver BC for two weeks. We’re headed for a week alongside one of Idaho’s great rivers then a week at the Sun Valley Jazz Fest before arriving in Mesa Arizona for two great months of tennis. Our travel trailer makes all this so easy and affordable. Our overhead costs are really low without a house, and our worries are even lower without a lawn, landscaping, gutters, paint, paving, utilities, and all the other encumbrances ownership entails. A favorite full-timer quip of ours is about looking for a jacket or headphones or any other piece of gear. “Hon, did we bring that iPod charger on this trip?” Well duh! You always know it’s here, because all your stuff is with you. Looking for it won’t take too long either — how long can it take to search a pickup truck and a 25′ trailer? Sure, you might wash the windows, dust, sweep AND mop faster than finding something, but still. . . knowing you WILL find it IS an advantage of living in a travel trailer. We are in Vancouver B.C., enjoying fabulous weather and a visit with Debbie’s daughter and family. A friend just mentioned she liked this post from three years ago (20090914). We do too and on our current visit we remind ourselves, “drive nice like a Canadian.” We thought we should repost this one, it is so true still in Vancouver. 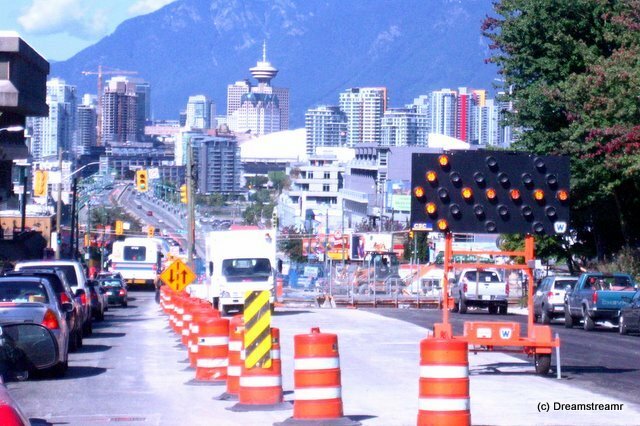 Vancouverites might be the most polite drivers in North America. We think they are and we have a lot of basis. We’ve driven this year in or through most big cities between Orlando, Florida and St Paul, Minnesota, and all four cities between Winnipeg, MB, and Vancouver, BC. The past two years, addiitonally, have found us touring cities and towns of all sizes in most of the midwest and western and southern states. We’ve met, or been passed by, a lot of drivers in hundreds of communities in two years. And none have been as courteous as the drivers in Vancouver, B.C. The courtesy extends to pedestrians and buses. This mayn’t seem much a courtesy since it is required by law to yield the crosswalk to pedestrians and the lane to buses. But it is likewise a law in almost all states to yield to pedestrians entering a crosswalk — and it just doesn’t work out so well in the states, for pedestrians. We each day drive from West Vancouver over the Lions Gate Bridge. Traffic in Vancouver being so full, we figured to wait it out each day and leave after ten or eleven o’clock in the morning for Kelsey’s house. You know, we can wait out rush hour and cruise right through town. It’s not so easy in this large a city. Remember, there are over two million people in greater Vancouver. The Lions Gate Bridge is only one or two lanes into town (all three lanes are convertible for either direction). Three double-lane roads lead to the north entrance to the bridge, heading toward town. How can all these lanes successfully merge without wrecks occurring all day long? This is the amazing part. Kelsey and Stephen call it zippering because the cars come together at the merge like teeth of a zipper. Almost without exception, at each of the three merges at the north end, the cars smoothly and almost mechanically fall into place into the single lane. It’s fascinating to watch, largely because it seems so unlikely. You don’t see competition for pole position, you don’t hear horns blaring or tires squealing and exhausts roaring. The cars approach the merge slowly and, in lockstep, fall in place one from first lane, one from second lane, one from first lane, one from second lane, over and over. You can look ahead, if you feel a need, and count the cars ahead in each lane. You know with some certainty which car you will fall in behind. No collisions, no cars stranded out on the right side wishing they could merge. Amazing! This is almost as good. We are stunned at the immediate allowance other drivers provide us when we display our turn signal to change lanes. The cars unhesitatingly let us into the next lane, slowing for us. The reaction we half expect, by conditioning, is the cars behind us to speed up and take the space we are requesting (or even hinting at) but not in Vancouver. Drivers in Vancouver unfailingly let us into their lane. An observation, from driving home last night, is the size of the other vehicles. We’re not suggesting this relates to their yielding to us, but all the cars about us as we cross downtown Vancouver are sub-compacts, less than 1/3 our truck’s gross weight. We were fairly surrounded last night, as we drove home, by Yaris, Echo, Fit, Mini, and other very small cars. Any of these would fit in our truck bed if the bed was empty. We see a few pickup trucks, but very few. The vast majority of cars around Vancouver are small or smaller. We were startled and completely unknowing, two or three years ago, why some traffic lights flash green and others stay solid green. Kelsey explained it to us in short order. This is very important to driving in Vancouver. Flashing green traffic lights are pedestrian-controlled. A car approaching the main street will encounter a stop sign and will not have a traffic light. The cars on the main street will see the flashing green light, or a yellow or red solid light. The pedestrian, wanting to cross the main street, pushes the walk button and the light relatively soon turns red for the main street to allow pedestrians to cross. Pedestrians get a nice break from cars even without the traffic lights or crosswalks. We were in Chinatown a few days ago and heard a horn blaring as a car careened through an intersection. The car had turned right from the main road and almost intercepted a couple of people stepping into the crosswalk. People looking on acted horrified, the walking couple was very startled, and the driver was almost certainly not “from around here”. We don’t think any Vancouverite would have plowed through a crosswalk ignoring pedestrians. Finally, here’s a plug for the bike routes. Vancouver has invested a lot of planning and money in creating bike-friendly and bike-only streets throughout the city. I rode Kelsey’s bicycle twenty blocks from the Community Centre on 16th at Ontario St to East 24th at Windsor St. The bike route has roundabouts at many intersections and pedestrian/biker-controlled signals at the few major intersections. The result was a quieter and safer ride home in a bustling city full of automobile traffic. There are exceptions to every rule, and no absolutes. Our experience with Vancouver traffic, though, has been wonderful. And we appreciate it greatly. We’ve done it! We survived a long caravan. Not just any long caravan, the 2012 WBCCI Alyeska caravan. We travel by ourselves or with another couple sometimes. Traveling with a group of 76 people is a different ball game, especially for sixty-three days. Weren’t sure Jim could play nice so long with so many people, but he mostly stayed out of trouble. It helped that the caravan was nicely paced. We had some “zero” days occasionally throughout the caravan to walk about or blog or reorganize ourselves. By the end of the caravan we felt like we could launch immediately into another caravan. Compared to dreamstreamr’s normal full-timing costs, we find caravans very expensive. The caravan drives up our costs for entertainment, food, camping and gasoline because we are paying to see more and drive (a lot) more. And we tend to dine out a little more than normally. Normally we tell people we’re not “on vacation”. The caravan puts us into vacation mode, both sightseeing- and costs-wise, for two months. Another factor is buying in Canada and Alaska is well more expensive than in most of the lower 48. Some folks seemed to do a lot of hardening on their trucks and trailers before this caravan, some folks seemed to have done nothing. We heard varied recommendations on vehicle and trailer preparation for the Alaska Caravan and tried to strike a reasonable middle strategy. Our trailer tires were one year old, truck tires two years. Trailer batteries were less than one year old. We protected the trailer’s exposed copper propane lines with foam insulation. A nice mesh covered our truck radiator grill and Jim and Bill Nicol covered the lower radiator inlets neatly with 1/4″ welded wire mesh. We covered the truck headlights, turn signals, and fog lights with 1/16″ lexan film. Our trailer did not look like this one. We did NOT remove or protect our propane bottles’ cover, nor cover the solar rock guards over the trailer’s front windows, nor cover the stainless rock guards over the trailer’s lower front quarters. We also did NOT cover the trailer’s side windows against rock damage. Our trailer and truck tires weathered all the roads, gravel, dirt, and asphalt, without puncture, delimitation or any other failure. Not everyone was so lucky — two people had tires delaminate, one with serious wheel well and secondary damage requiring an entire day’s repair by three men. Approx twenty tires required replacement over the course of the caravan. We suffered many rock dings in our windshield. The past six years have seen several repairs to rock dings in this windshield. It may be past filling, we’ll see when we get to Mesa in November. But our headlights, turn signals, fog lights seem untouched. We didn’t hear of anyone suffering damage to their front lights. But at least two tow vehicles suffered broken windshields on the caravan. The trailer in this picture looks ding-proof, unlike ours. Our trailer’s front rock guards, lexan above and stainless below, picked up a lot of rock dings. These manifest as little stars on the solar (lexan) rock guards but these were already thoroughly dinged up so no biggie. The stainless steel guards have many small dents in them, as befits their purpose. They protect the trailer against these dents. We did cut silver bubble wrap to cover some windows to keep out the endless daylight. When we visited Alaska four years ago, we had difficulty adjusting to the bright nights in our RV. This time, because we traveled slowly to the upper latitudes, we were accustomed to the longer days. We didn’t need light-darkening any more than our trailer already has. The caravan wasn’t what we expected. The description in the club’s magazine doesn’t do the caravan justice. Airstream friends warned us about road hazards and measures to take, but we otherwise had little preparation for what we would encounter. We had no road worries and found northern BC, southwest Yukon, and Alaska beautiful, fascinating, and wonderful. They’ll be more affordable on our own next time, and we are looking forward to the revisit. Our caravan stopped a few days in Hyder AK. We described this stop in our prior post. A perfect finish on Hyder AK and Stewart BC might be visiting Smithers and Prince George B.C. Our caravan stopped a couple of nights in Smithers in a nice combi RV and golf park just a little ways off the highway. Only one of the Airstreams was bonked on the roof by a stray golf ball, as far as we know. And it was here we had our caravan’s nice open house we wrote about here. We’d been in the smallest and least functional town, and now we’re straight onto big towns. Only Anchorage and Fairbanks are likely any larger so these two are the third and fourth largest towns we’ve been in since Whitehorse at least. We enjoyed checking architecture in several neighborhoods and touring Smithers’ really cute downtown district, had great campfires, and fine weather still. Prince George is fourth largest city in B.C., and surely offers more than we were wont to partake at this point in our caravan. A great advantage, though, is having a convention hotel with large dining and meeting space for our final banquet. The food and beverage folks set us up really well for this affair. After-dinner show emceed by . . . The caravan leader asked Jim to emcee. A lot of folks thought Jim likely to wear shorts to this dress-up occasion, even if he wore jacket and tie. You can’t tell from this photo, but he was really dressed up with slacks too. They serenaded us throughout the caravan at our campfires and on our cruises. And they were well practiced for this great performance. Nanci and Tommy played a bunch of favorites and some originals too. The caravan was lucky to have them and Paul (and their ukeleles) along, and some of us are now attracted to trying to play the ukes. It helped our mental health to get up, mosey around, have a cup of tea before heading out on driving days. We would sometimes leave almost an hour behind the last ones. Some of them stopped for sit-down breakfasts, we think. By lunchtime we often had caught up with too many of our group and couldn’t find a place to park. The later we left, the better chance some of the early folks might have moved on and made room for us. Janine and Bob were our most frequent traveling buddies — we were all very content to let all the folks in a hurry go in front of us. Our driving/towing and rest-stopping styles were compatible, and we mutually eschewed talkiness on the chicken-band radios. Anyhow, in this picture Bob is demonstrating the difficulties Janine had following his guidance when she needed to back the trailer up more than the usual distance. It seemed pretty trying. Judy and David and Barbara and Cal did a good job parodying group movement on the many sea life cruises our caravan took. Side deck space was limited, and the exciting side even more so. Then the other side would become exciting. Some were just trying to keep their lunch down and were far less interested in what lay beyond the railings. Everyone in the audience identified with the characters in this fun skit. Another highlight was the Northern Cal folks demonstrating best Alaska travel couture. They had several great takes on some of the quirky weather and wild we endured. Mike models his mosquito-proof head cover, walking stick topped with a large sheath knife, bear spray can in a holster across his chest, binoculars, and a camera. He’s ready for any outdoor activity! We had a great time, Jim really enjoyed emceeing, Shelley did a fabulous job directing the entertainment, the food was excellent, and the farewells were lengthy. How else can 72 people say “see you down the road” to each other? It takes a while, and was a fitting end to our great caravan. Alaska was everything we’d heard and much much more. The WBCCI Alyeska caravan gets folks to all the best spots and a few others too. Travels with a caravan are nice because all the destinations are arranged as are the cruises and some of the meals. Caravans involve tearing down the tents and moving after fewer days than we’d stay, if on our own. This way, though, we get to see so many more places in only 63 days. We highly recommend the WBCCI caravan. We’ll look forward to returning with another couple or two sometime before long, and stay longer in some places. Or maybe move there for a season? Do Bears Really Sweep Streets in Hyder AK? Yes. I’ll get back to this in a minute. Our WBCCI Alyeska Caravan traveled from Dease Lake down the absolutely gorgeous Stewart Cassiar Highway to Hyder AK for a few nights. Two full days allowed us great time to check out local history, look for bears, buy fudge, all the normal caravan activities. We stayed in Camp Run-A-Muck in Hyder, a nice little campground close enough to everything in Hyder but driving distance from Fish Creek or Salmon Glacier. If you’re a terrorist, read no further. Jim is standing on the International Border, there are probably cameras (other than ours) but we didn’t see them. Duh, you’re not supposed to, right? This international border does not check passports nor vehicles passing from Canada into the USA. WOW! Anyone can pass unobstructed into the USA here!!! What would our nationalistic tea partiers think? We didn’t go to Salmon Glacier, nor did we charter a plane to Ketchikan although some in our caravan did both of these. This was probably the best glacier view in all of Alaska, and we’ll see great pictures of it on someone else’s blog. We were already throughly glaciated. Instead we enjoyed leisurely walks throughout Hyder’s few streets and thorough touring of Stewart. It was nice to take our time and enjoy the slow pace here. Stewart was our favorite, by far, of the two towns. This is 5:00 p.m. Monday afternoon downtown Stewart BC. We had no preconceived notions about Stewart BC or Hyder, and still were a bit surprised by what we found. Stewart was pretty nice with residential areas, a school, several government buildings and an intact, if small, business district. Hyder was less. Much less. Stewart warrants touring about on foot, stopping in several shops including a bakery/coffee shop or two and some gift shops. We spent most of our time in two places, the museum and the boardwalk. The nice Stewart museum can take half an hour or several hours. We did the several hour thing there and loved it. They do a nice job representing lots of local lore and examples of early times in Stewart and surrounding communities. One of our favorites was the hour-long video showing upstairs. Fish Creek, a local bear hang-out, provided us an evening’s entertainment watching bears easily catch and eat salmon. US Fish and Wildlife runs this fee area to allow somewhat safe viewing of the bear in natural habitat. It was most unnatural because we are on a wooden deck above the bushes and river and the bears most certainly can hear the noisy humans chatting and excitedly pointing out any siting of movement in the bushes. Reminded me of Vonnegut’s Slaughterhouse Five, when Valerie Perrine is the bear who is very conscious of the many watchers. Hyder is in a thirty-plus year recession, apparently. Despite this, someone is funding curb and gutter and paving. We wondered if the mining corporation is compensating Hyder by paving the town’s one road they pass so frequently on. Go figure. . . The local post office is very local — a small mobile building with permanent roof construction above it to protect the small building. Simms Montana has a much nicer post office and seems smaller even than Hyder. Hyder just seems down in several ways. We found two businesses open on main street and two businesses (owned and operated by one couple) on another street. That’s it. Two houses seemed finished, the other twenty or so didn’t. We gratefully didn’t have a face-to-face encounter with a prowling bear in the streets. But our caravan friends did. They were chased from one of the restaurants by the owner shouting, “Bear, bear!” as she sicced her dog after the bear. We bumped into Barbara and Judy a few minutes later and they excitedly told us about their near-encounter. Our walk back to the campground was far less relaxed as we anticipated a beary encounter. Some of our caravaners have pictures of a bear climbing onto the campground picnic table in an adjacent campsite to theirs, and others watched as one of the street-cart restauranteurs pulled a shotgun from under her cart and fired it into the air to scare an otherwise unafraid bear away from her outdoor dining area. Wild and wooly! We enjoyed our visit here, it was a fitting cap to our small-town Alaska encounters. Next we head for our last two caravan stops, Smithers and Prince George B.C. See you there! Our Airstream Caravan touring Alaska, Yukon, and B.C. stopped two nights in Smithers BC. Near the end of our epic sixty three-day tour together, we agreed to conduct an open house at this stop. We would hide our dirty laundry (plenty of that) and money (not much of that), maybe leave a snack on our table, and head out to see others’ Airstreams for a couple of hours. We have in our caravan group a 1961, 1964, several 1970’s models, a few 1980’s and 1990’s, and a bunch of 2000’s models. All the trailers are tow-behinds. Although Airstream very briefly sold a fifth wheel, none are on our caravan. Airstream also manufactured a bunch of Argosy trailers, same shape as ours, but beige or white instead of silver. Airstream also made some square ‘streams, both under Airstream and Argosy names, neat roomy RVs. None of these are on our caravan either. Trailer sizes on our caravan vary from 22′ to 34′, with a preponderance of 25’s (the size of ours too). There are four 34s, five 23s, a 24, twelve 25s, a 26, and nine are 28′ through 31′. We also have four motorhomes but we don’t know as much about them. I’ll get back to this. Of our 32 Airstream trailers still on the caravan (two have left early), 26 participated in our open house today. Several had pressing obligations and couldn’t join in. We missed them, but I’m not sure how we could have visited more than 26 in the two hour time frame. Or how we could have eaten six more brownies or cookies, or pieces of fudge, or jelly beans, or crackers and cheese. Here’s the trick — no two Airstreams are alike. Even if their floorplan were identical (and some are), the factory is almost reliably inconsistent about arranging some details within. Some floor plans are only offered in certain years, as are certain finishes. Some years oak is offered, others hickory, and some of us have no natural-finish hardwood at all. Our 25′ model, the CCD International Sleeps Six, is no longer available, and our floor plan is not available in any of Airstream’s lines. The owners invariably add and subtract to suit themselves and their vision of RVing in their Airstream. We are therefore blessed with tremendous variety of ideas for customization and enhancement for our own trailers based upon seeing, firsthand, how our fellow caravaners have made their improvements. Examples include a nifty thumb lever to unlatch the screen door in a single motion; very cool cast cabinet pulls in a twig pattern; new (and old) ways to keep drawers and doors from opening while traveling; arrangements for catalytic heaters; replacing sofas with more comfortable and supporting chairs; more efficient lighting choices; fun with fabrics; and on and on. Some very smart Airstreamers carried pen and paper (way to go, Shelley and Jim!) and took notes on what they liked. Others took pictures to remind them of their favorite features. More than fifty of us passed each other many times criss-crossing between parking sites, comparing notes on what we liked best about this trailer or that. The day was cool and bright, bugs were few, and brief morning showers quickly passed to provide us a perfect day for this fun sharing. We saw some features we might adopt and enjoy, and many many great ideas that perfectly suit their owners’ styles. It was fun to see the great variety of vintages, sizes, floor plans, treatments, (and snacks). I was a little surprised and disappointed none of the four Airstream motorhome couples in our caravan expressed any interest in this fun event. If the same ratio of motor homes as trailers had participated, three of the motor home couples would have been in. Maybe they do this sort of thing at FMCA events and don’t really have as much interest in Airstream trailers? They might not realize we relish the chance to see their big cool RVs, so different from our own. The Airstream motor homes are really nice inside, but we didn’t see any this time. Maybe next time we’ll work a little harder to make sure everyone feels very welcome to participate. And we should strongly encourage those who don’t feel comfortable showing their RVs, they are very welcome still to visit with us. We like to show our places off to almost anyone. And we know if you’ve seen one Airstream, you’ve only seen one.